Every summer I spice things up with dying my hair a new color. It may sound crazy, but summer is my vacation time, so why not enjoy it with a new look? Last summer I was a full blonde, but this summer, I chose a deep red! Who doesn’t love red hair? It’s super feminine and chic! I have always wanted to be a red head, and I finally got the guts to do it. While red hair is stunning, there is one huge problem that I learned right away with it…..it strips faster than any other color. I could not believe the amount of color that would wash out even after two months of not dying my hair. I would try to make sure that I could keep the color in with several products that claimed to hold in color, but it was no use. Nothing could stop that strawberry colored water every time I washed my hair. I was also having to spend lots of money every month brightening the color to keep it looking fresh and new. 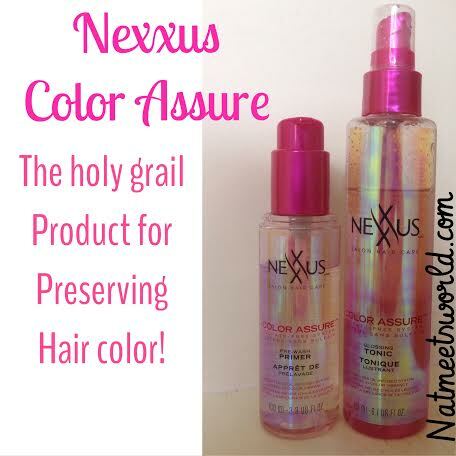 I finally stumbled upon Nexxus’ new line of color protecting products, Color Assure. This line protects color treated hair like no other! There are four components to this line: A pre-wash primer, color assure shampoo, color assure conditioner, and glossing tonic. Before washing your hair, cover your roots with the pre-wash primer. This acts like a barrier between your shampoo and hair so that it repels water as you wash. The shampoo and conditioner both smell amazing too. The white orchid scent is infused in all four products so that you can enjoy it over and over. Last, you will need to spritz on the glossing tonic which is a weightless oil mist that brings out your most vibrant color. After using all four products, I was truly amazed at how bright my red hair remained. What was more surprising was the faint color of red in the water during my shower (which meant that the primer was super effective). My favorite products from this particular line are the glossing tonic and primer. If you are looking to maintain your color, but not spend a fortune on the whole set, buy these two products, and you are good to go! Even though these products are sold at stores and not salons, Nexxus is a salon quality product so it can be pricey if you are used to purchasing hair products under $10. I found these products at Wal-Mart, however, you can find it in Target and your local grocery store. Try out Nexxus’ new Color Assure line, you won’t regret it! Have you tried this line already? What did you think? Comment below! « Guess Who Is D23’s Geek of the Week? !